Mixed media on cardboard, signed in the lower right corner „H. Mueller“. Provenance: Formerly Collection Arnold Blome, legacy to his son Peter. Hans Mueller was born as Johannes Müller in 1901 in Bremen. From 1922 to 1926 he studied at the Staatliche Bremer Kunstgewerbeschule at the class of Prof. Ernst Müller-Scheeßel. As member of the Bremer Kunstverein he started to exhibit his works in collective exhibitions from 1922 on. Mueller became master student of the graphic artist Prof. Willy Menz and, besides studying, ran his own studio for applied graphic art. Mueller was active as writer aswell. He wrote theater and radio plays, drama, short stories and essays and made translations and interpretations of ancient Greek, Latin, French, Flemish and English texts. He continued his studies in 1927 at Prof. Willy Jaeckels class in Berlin. During the 3rd Reich, he exhibited until 1938 but failed to cope with the regulations of the Reichskulturkammer. In the „degenerate art campaign“ five of his works were seized from the Kunsthalle Bremen. Under the growing pressure of the art doctrine of the National Socialists, Mueller destroyed and dismissed many of his modernist works and compositions. He resigned from the artscene and worked more as a writer. Due to his weak constitution, he was ineligible for military service. After the war, Mueller began to draw and paint again. 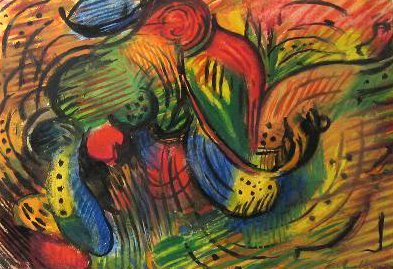 In the 1950ies, where the present work was executed, he mostly created nudes and abstract works. He participated in many exhibitions for example at the Bremer Künstlerbund, the Graphisches Kabinett and the Kunsthalle Bremen until the 1907ies when he, again, concentrated more on writing. Hanns Mueller died in 1999 in Bremen.